Figure below shows the common source amplifier circuit. 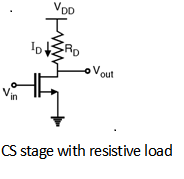 In this circuit the MOSFET converts variations in the gate-source voltage into a small signal drain current which passes through a resistive load and generates the amplified voltage across the load resistor. Also, from small signal model of shown in above Figure. The current gain and input impedance will not be affected by CLM and theses are Ai = Â¥ and Rin = Â¥. But the output impedance is affected because of CLM. 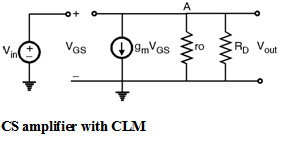 In order to calculate the output impedance of CS amplifier with CLM consider the circuit as shown in Figure below. 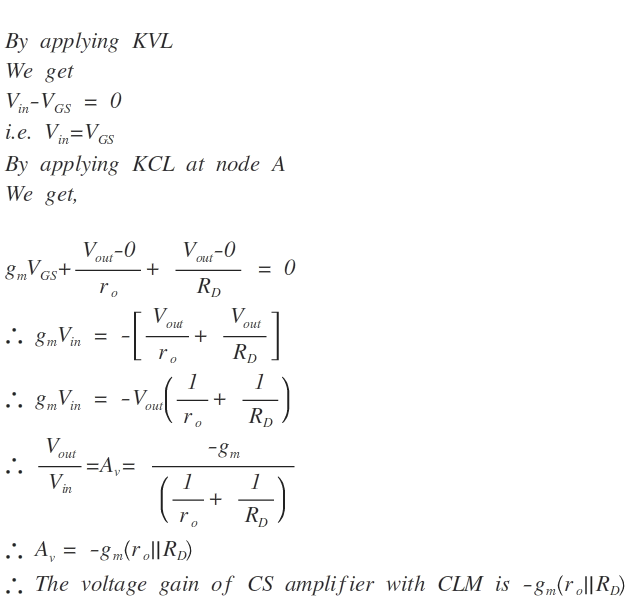 Thus, the output impedance of the CS amplifier with CLM is ro || R D.
where l is channel length modulation coefficient. Differentiating this equation with respect to Vin. 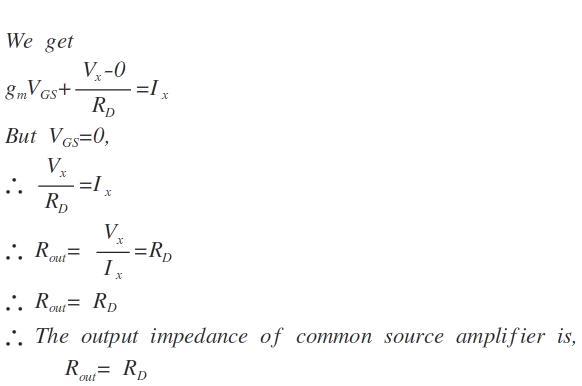 which is same as the voltage gain derived using small signal model. 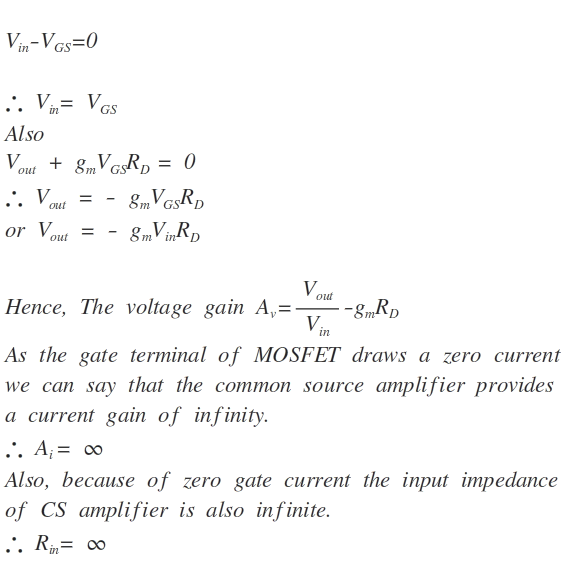 Thus, the voltage gain of CS amplifier is depends upon the transconductance gm, the linear resistor ro and load. In order to increase the gain we have to increase the gm. Inturn we have to increase the ratio. 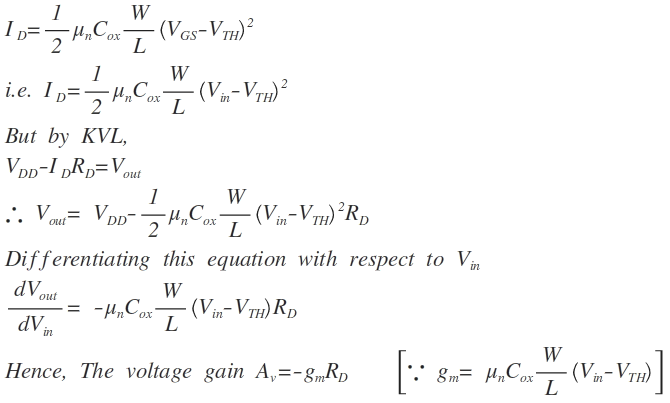 Hence the gain of amplifier is increases with increasing 'W' and decreasing 'L'. The ro resistance is appears in shunt with RD because of this the effect of ro (i.e. channel length modulation) decreases the voltage gain of amplifier on the other hand the effect of parallel combination of ro and RD decreases the output impedance (R out) which is the beneficial effect.